It is now July and I have used it all of three times, twice for the same recipe. This is due in part to the fact that it’s a beast – as large as a desktop computer screen from the early 90s and equipped with so many bits and pieces that the idea of assembling it, then disassembling it, then cleaning every nook and cranny with a dishcloth has convinced me that, for the most part, it’s better off left in the box. It also came with a hefty “congratulations on your purchase” brochure and an instructional DVD, just in case you put part “y” with part “x”, when part “y” should actually go inside part “z”. Ugh. I get tired just thinking about it. This aversion has also been nurtured by the serious lack of counter space in my kitchen(ette). The food prep area is the size of a standard cutting board and often vies for territory with the dish rack. It’s a sad sight, but I’ve made sure that “large, sprawling countertop” has made it into my mental list of “things to work towards to be happier” (weirdly, “large sprawling countertop” also coincides with “reasons to marry rich”). Hm, what were we talking about? Right. The food processor. Despite my general ambivalence towards using it, there are moments when I decide to extract it from the box, specifically when the option of not using it is more distressing. The recipe below is the perfect example of how the food processor can be useful, and ultimately, more friend than foe. 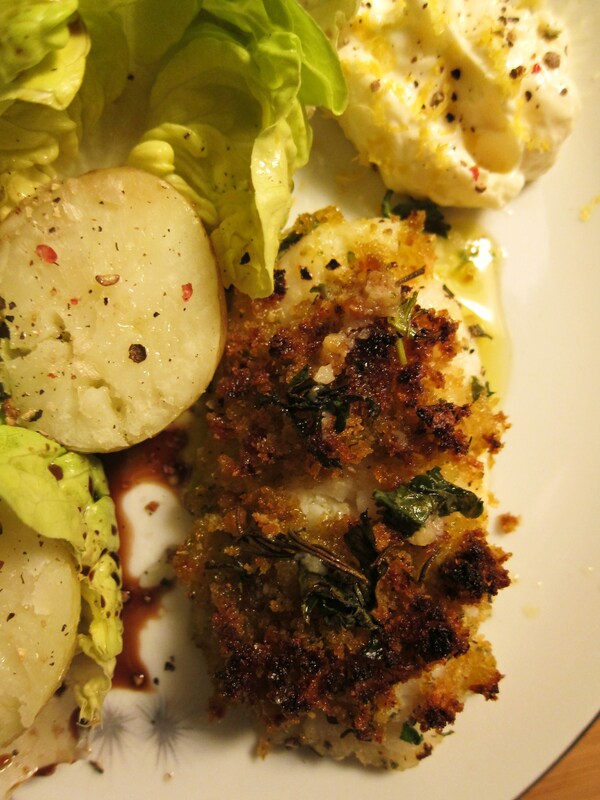 The recipe itself is a variation of “Tasty Crusted Cod” from Jamie Oliver’s Meals in Minutes. It calls for home-made breadcrumbs, which I can’t say I often have on hand. What I do often have on hand, for some absurd reason, is a big hunk of baguette in the freezer. Now, I don’t know if you’ve ever tried to make breadcrumbs from frozen bread by hand, but it ain’t pretty and commonly results box-grater wounds. Enter Food Processor Maximus – the device that allows you to pulse up some breadcrumbs both quickly and gracefully. If you’re using fresh bread, I suggest making a batch for the freezer so that you can return the food processor to its box for a long summer’s nap. The recipe “variation” mentioned above is two-fold, in that the peripheral ingredients are slightly different, as well as the main feature – the fish. 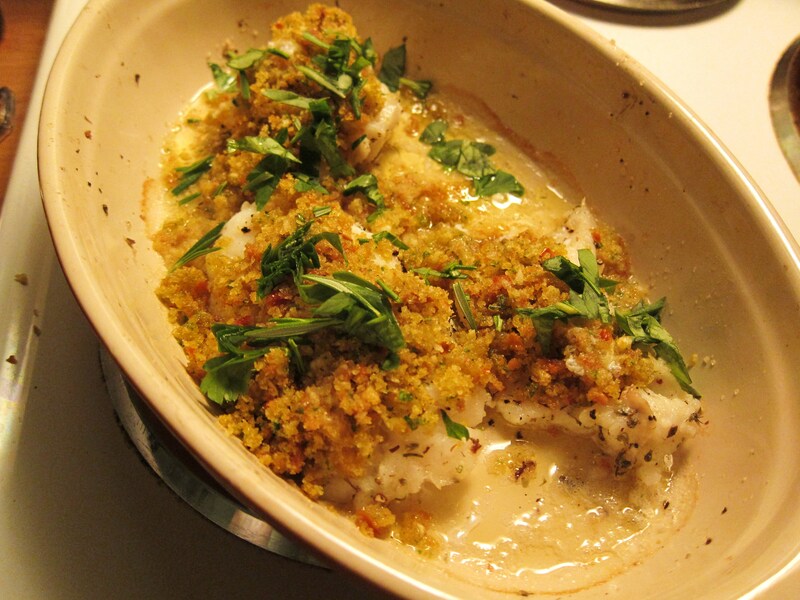 As the name suggests, this dish is to be made with cod. But when I arrived at the fish monger’s, he was fresh out. Undissuaded, I asked him to suggest a good alternative. “Nous avons des beaux morceaux de lotte, mademoiselle”, he said, emphasizing that it had the same toothsome texture, white flesh and mild flavour. I concluded that Jaime Oliver would approve and brought it home. After a few more minutes typing search words into my computer, I discovered that this was probably NOT the lotte found in the fresh waters of Québec. But regardless of which variety had ended up in my kitchen, one fact remains true: “lotte” is bottom-feeder, and thus slimy, limp and amphibian-like. This was not the visual that had inspired me to make “Tasty Crusted Cod”. Also, the fact that a) I have a pretty vivid imagination and b) I’d just watched Alien the night before may not have aided the situation. After coming across a few more unfortunate photos, I shut off the computer, walked to the kitchen and decided that it was silly to discriminate between a “pretty” fish and an “ugly” fish and began prepping it for the oven. I likened it to kissing the frog before he turns into a prince – it would be weird at first, but worth it in the end. And, as luck would have it, my lotte-fish prince turned out to be quite a hunky specimen, cloaked in herbs and toasted breadcrumbs. Lesson learned? Kiss the frog. You may just live happily ever after. Find an oven-proof dish large enough to accommodate the fish and drizzle some olive oil over the bottom. Sprinkle the salt and pepper into the dish and then add the fish fillets, tossing them in the oil mixture. Place the dish on the middle rack of the oven and turn it on to broil. Allow to cook for about 5 minutes. Break the bread into rough chunks and place in a food processor. Crush one clove of garlic and toss them in the machine; as it’s processing, add a drizzle of olive oil through the feed tube. Blend until you have breadcrumbs then empty them into a bowl. Place the anchovy fillets into the food processor with the sun-dried tomatoes and a little of their oil. Add the other two cloves of garlic, chunk of Parmesan and the basil. Grate in the zest from half a lemon and squeeze in the juice. Add a splash of balsamic vinegar and blend to make a paste. Remove the fish from the oven and spread a layer of the tomato-mixture over the top of the fillets; add a layer of breadcrumbs. Top with the thyme sprigs then place back under the broiler until the breadcrumbs have turned golden brown (8-10 minutes). and the question is… why “monkfish”? Well, according to Wikipedia: “These strange fish got their name from Monks who used to go to the docks and ask for the ugly fish that the fishermen would throw away” – but I feel that could be a entirely fabricated answer.